Thiamin diphosphate, the coenzyme form of vitamin B-1, is important for the production of energy from carbohydrates, for synthesis of the key neurotransmitter acetylcholine, and for nerve cell membrane function. sorbitol, mannitol, natural peppermint flavor, sodium citrate and magnesium stearate. 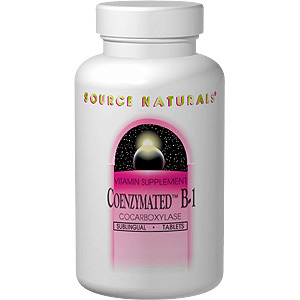 Coenzymated™ B-1 Sublingual 25 mg - 60 tabs, (SOURCE NATURALS) is shipped in a discrete, unmarked package. Orders are processed immediately and usually take about 3 to 5 working days to be received. We do ask that you try it for 2 to 3 weeks to feel the full effects. Any information received is used only for order processing and shipping purposes. Your information, such as e-mail address, will never be disclosed to a third party.